This wild crafted essential oil has an atypical citrus scent with unique nuances because of the natural constituent, laevo-citronellal. Though Steffan Arctander describes the scent as somewhat similar to Eucalyptus Citriodora, Combava Petitgrain is sweeter and lacks any medicinal notes. Studies at Kinki University in Japan found that it has strong anti-inflammatory properties. Other research has shown that it combats depression. It's medical properties are anti-inflammatory, antidepressant, relaxant, rich in citronellal which possesses calmative properties. Use it for stress, anxiety and trauma. Dilute 1:1with carrier oil to apply on location. Diffuse up to 30 minutes three times daily. Directly inhale. Use on vita flex points. Found in Trauma Blend. In one study, Citrus hystrix essential oil showed good potential for being used as a natural cockroach repellent. This is my favorite Petitgrain...crisp, tart, with a lemon/citrus tang. It freshens the air and uplifts the spirit. A few drops in the lamp or diffuser bring a total change in the atmosphere. 1. The juice and rinds of the kaffir lime are used in traditional Indonesian medicine; for this reason the fruit is sometimes referred to in Indonesia as jeruk obat - literally "medicine citrus". 2. The very fragrant fruits and leaves of the kaffir lime tree are incredibly important in Thai cooking, providing a unique flavor that lovers of the cuisine instantly recognize. The lively fragrance and delicious flavor of the leaves is truly one-of-a-kind. 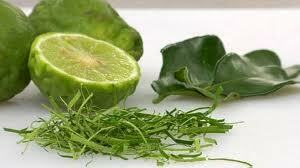 In fact, kaffir lime leaves cannot be really be replaced with any other type of citrus leaves. The flavor is so important that anyone following a Thai recipe should take the time to find and use them as their special characteristics are irreplaceable. 4.The luscious perfume and striking flavor of the leaves cannot be easily substituted with other kinds of citrus leaves. They are worth seeking, as their special attributes are irreplaceable. This requires nothing more than copious amounts of kaffir lime juice which is rubbed through the hair and left for 15-20 minutes. The juice cleans the hair shafts and scalp of impurities left from conditioners and other commericial treatments, and when it is washed clean, hair is left with a silky glow. 6.Bouquet: The leaves and rind have a perfume unlike any other citrus, sometimes called mysterious or haunting. There is a combined lemon/lime/mandarin aroma but clearly an identity of its own. Essential oils extracted from the limes and leaves produce a vast variety of products such as air fresheners, deodorants, detergents, soaps and shampoos. Some of the oils produced are often used for the treatment of both the hair and scalp. One wash with the shampoo will not only leave your hair squeaky clean but it also helps in reviving your scalp. The limes have also been used by Thai women for generations as a natural bleach to remove even the toughest stains. They feel that nothing works better on stains than a few drops of Kaffir Lime Juice mixed with a small amount of detergent. Not only does it clean effectively, it's sweet-smelling.